I definitely do not think I’m the perfect mother. 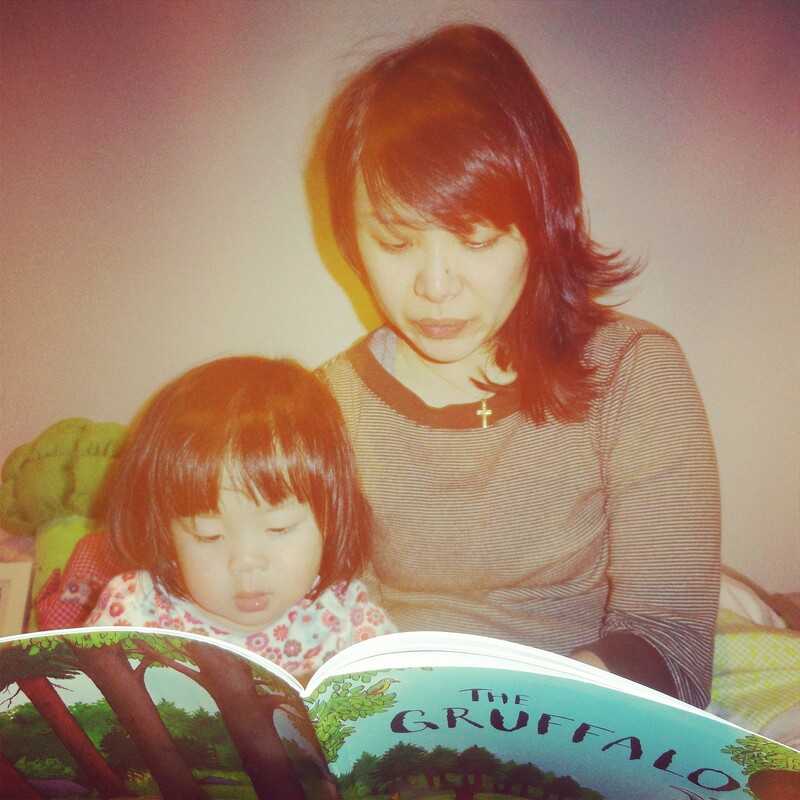 I get unreasonably impatient when I’m teaching or reading to Iris. I use the dreaded “not today, we’ll do it tomorrow” way more than I should. AND…..I let her watch television when I need to do something else. Every other day I lose my temper with her, mostly just a little, sometimes a lot. Take Monday. I spent the morning cleaning the house, which meant that I had to keep her out of the path of the hoover. I managed to occupy her for half an hour with painting. Then I resorted to the television. When I was ready to mop, I decided to ask her to help water the plants. Full-on brat tantrum ensued. “I don’t want to!” kicking legs, rolling on the ground, “No!” kicking legs, “Noooooo!” I lost it. I yelled at her and threatened to disown her. Finally, I realised we both needed a “time out” after which, she acquiesced to water the plants. Once I allowed her to play with the water outside, she stayed out of my hair while I made lunch. That was not the end of it. She proceeded to have several more tantrums and shouted out her demands and refusals throughout the day. Every time she wailed, “I want it NOW!” I wanted to throw in the towel and run away. Instead I gave her a stern lecture on not being a brat and that if she was so unpleasant, no one would want to do anything with her or for her. I was rewarded the following day with three puddles of pee in the house and four sets of soiled pants. I had in turn been duly reprimanded, toddler style. At the end of the day, I think the most important thing is that a child feels loved. So to make up for all my motherly transgressions I give lots and lots of cuddles and kisses; I tell her I love her several times a day; and for each time I reject her play advances, I make the effort to play with her the next time she asks me to. For each roll of my eyes, I have at least 20 “I can’t believe this human being is my child” moments. She constantly amazes me with her growing intelligence, her wit, grace and boundless energy, which apart from using to climb everything in sight, she spends on making me laugh and returning my affection. I figure I’m doing okay because Iris is happy, healthy and shows her love for me more than any other family member. Plus, I’m the only one she really listens to (*read is afraid of). 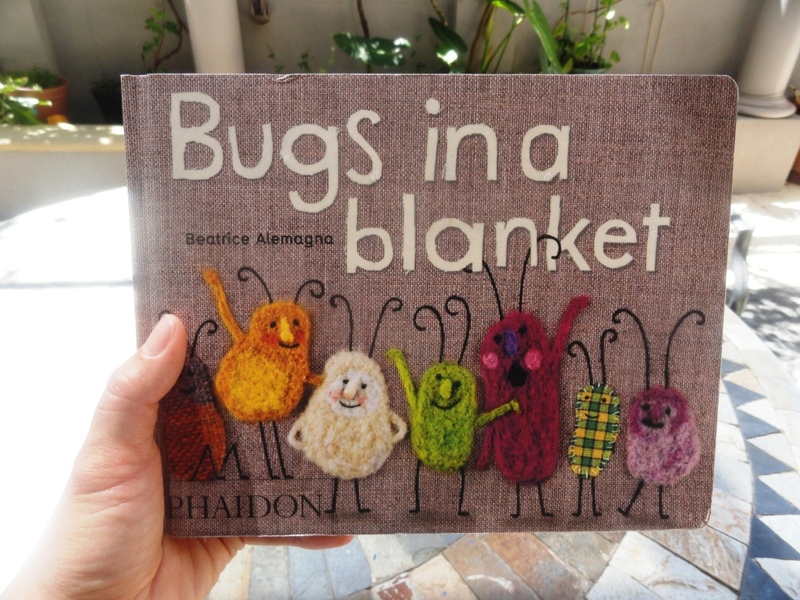 Beatrice Alemagna’s Bugs in a Blanket reminds me that we’re all different and I can’t expect even someone with half my genes to be like me. Iris will be her own person and I need to keep that in mind, especially when she exhibits Papa’s propensity for mess-making. 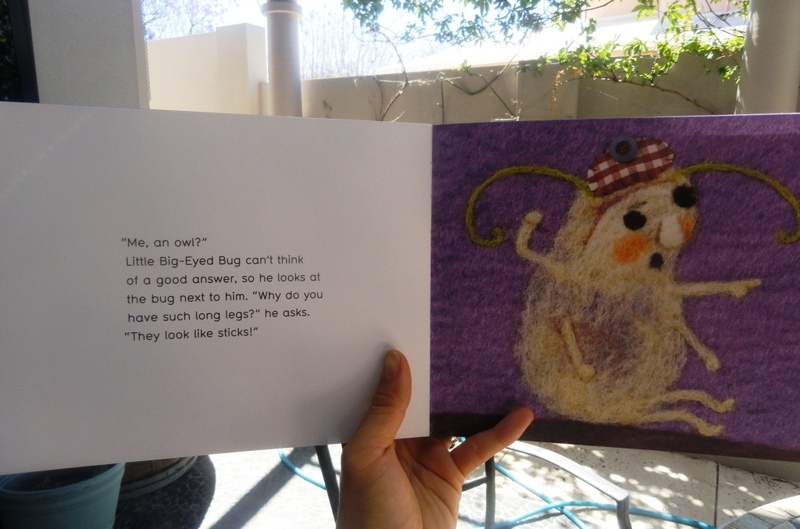 Bugs in a Blanket has gorgeous crafty illustrations Iris is constantly mistaking for a touchy-feely book and a simple but witty story line. It was a gift from an old friend visiting from London (thanks Delaina!) and published by visual arts powerhouse, Phaidon no less. Who could resist a cover full of fluffy bugs?! 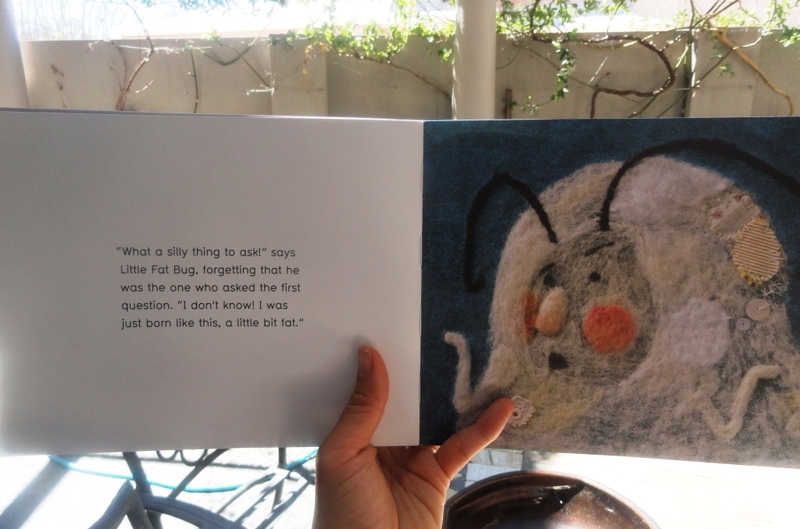 All the bugs in an old blanket have been invited to Little Fat Bug’s birthday party. They’ve never met each other before though apparently they’ve been living in the blanket for years and years. So when Little Fat Bug opens the “door” of the big hole in the middle, he is unpleasantly surprised to find all these other not fat and not white bugs staring back at him. His immediate reaction is typically ego-centric and unthinking. He picks out the most salient feature of the bug right in front of him and demands to know why he is so thin as if it is that bug’s fault for being so. This starts a domino effect, with each bug accusing the next of being yellow, big-eyed, long-legged and speckled. It comes back full circle to Little Fat Bug when he is questioned on his corpulence. To which he replies that he can’t help it, he was born that way. As each bug in turn realises that they have all been born the way they are, they all come to the happy conclusion that they can’t help being who they are and proceed to have a riotous dancing party. If only all the problems in the world could be solved thus, with a massive jig.